The move has been delayed. It's not that we're not ready, we're more than ready, but our Internet provider can't guarantee a date they will get our Internet installed. The only good news with this is we don't have to be out of our current offices until January 31st. Still, who wants to be moving in January? Frustration. Before I left for my California vacation, I went to the new space to see my office. 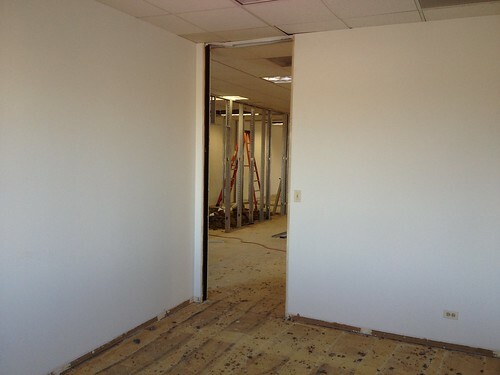 They had all the framing up for the other offices and our large equipment storage area. There was a huge kerfluffle about the "kitchen". Without checking with us, they made a closet at the front, where you walk in, 2.5 times the size we directed. This cut our kitchen space in half. Because of ADA requirements, the things we wanted to do in the kitchen could not be possible. To say Mike was angry was something of an understatement. Of course, the contractor absolved himself of any mistake, saying he worked off the plans and the architect, who drew up the plans, says what they built is not what he designed. The bottom line is that we had to do work arounds for what we wanted because of bathroom size and that they had walls framed up already. Realistically, we don't need much. Unfortunately, the requirements of the job are such that someone with a wheelchair would not be a candidate for employment with us unless we decide we need solely office help. Therefore, we can get by with what is a huge disappointment in a kitchen. 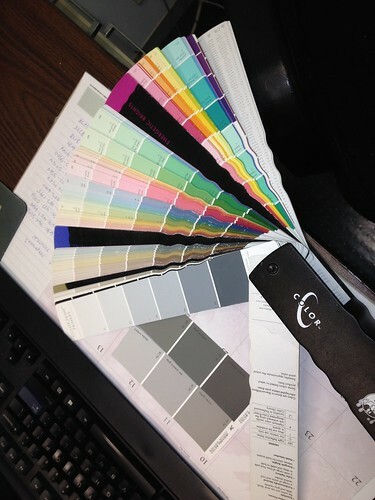 We were given a large palette of color samples and told to pick colors. and a lighter gray on the other walls. The neutral gray would be offset by color in the things I display. But, as I stood in that space and looked around, I thought, "I could do more than gray." This is what I'm getting. you can see I have a header and a large sill. This is an east window. This wall is Hawkeye gold. It wasn't called that but it matched the proper color. When I move in, photos will go on part of the sill. I will buy a plant stand for the left corner and put the white geranium I bought this year on the stand. I also have an aloe vera plant my sister gave me years ago and that will also go on the stand. The wall with the door is still going to be painted a very dark gray. I did consider black but I think it would have been too dark. The doors are going to be a honey oak stain. Our carpet has gray and blue and tan in it. (Somewhere I have a photo of the sample.) I also didn't want to feel "closed in" by the dark of the wall or have the bright yellow make it too hard on the eyes in the morning before the sun moved south. There are these two long walls. This is the wall in the front area, where you'll enter the building. 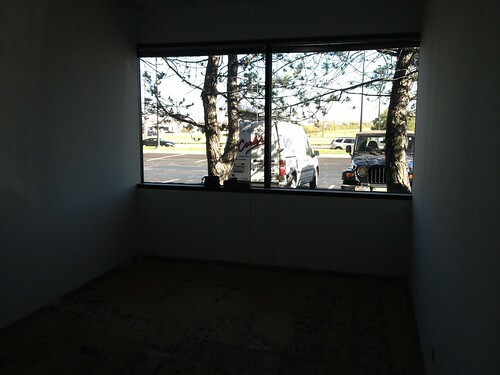 In the middle of this wall is to be a sliding glass window with a shelf. Incoming and outgoing mail will be dropped on this shelf. We have a magnetized sign that I'm going to affix to the bottom of the window to the left of the entry door. We are not the kind of company that gets walk-ins but we do want people to know where we are. This, and all common areas, is painted a light blue. The wall opposite this one is painted a darker accent blue. There is white tile with gray, black and silver accents in the entry and running to the back storage room. This will keep the carpet clean if we have deliveries come in the front door. This is the long wall I've talked about before. This is opposite where the window goes. In thinking about this, I decided to paint the two long walls a light ivory color which complements the dark gray and the yellow. 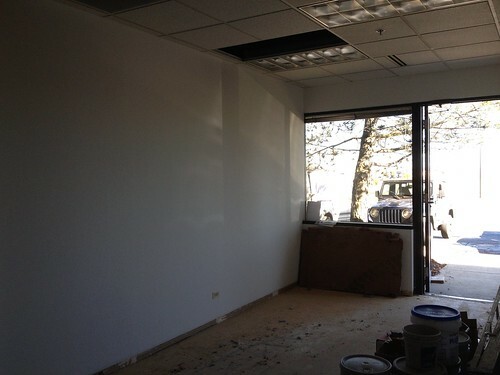 On this wall will be stenciled a large Tiger Hawk, the logo of the Hawkeyes. This office is twice the size of my current one. I've looked at wall stencils, premade, which you just slap up on the wall. I don't think they are large enough. The Tiger Hawk is something I will do so it will be probably January before I get that done. Originally, I was going to put my desk square with my back to the Hawk wall. 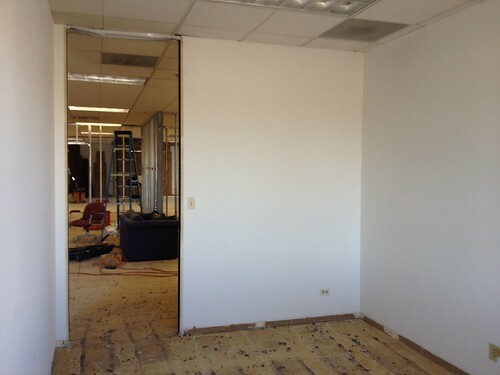 But Mike pointed out that desks will have to go where outlets and internet get strung. I asked for the outlet and internet to be in the middle of the long wall. We'll see. I've also given some consideration to, if there is room, a diagonal arrangement in the northeast corner so I can look more at the entry to my office. Our official move has been pushed back a week. We are low on boxes and are down to a lot of little items. Everything has to come off the walls. Bric-a-brac and souvenirs need to be boxed up. On December 12th, the moving company will come and take all the big stuff. Since we have until January 31st to be completely moved, Mike decided we'd toss material in our cars and make trips up at least once a day, assuming we're not out in the field. That way, we will be able to move all the little things and not worry about needing boxes. Plus, the movers won't be moving computers. We're doing that. Mike said the contractor wasn't too thrilled that there were 11 different colors going on walls, but, because they screwed up our kitchen, they needed to make things right. 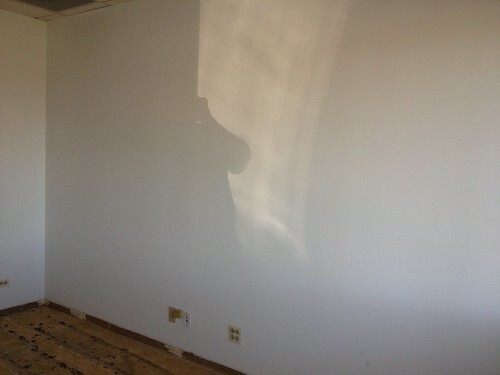 He said most of the painting had been done, but he was unhappy with the color he picked for his office. We questioned it at the time, but he was insistent. Each one of us picked a different color for our offices and we picked a light tan for the bathroom walls. Tara and I are going to slowly add decoration to the bathrooms and we felt tan would be a great neutral background. We're talking about a beach theme in one and a garden theme in another. I am, of course, the one who picked three colors. I'm not feeling wistful or nostalgic, yet. I expect that to happen once all the furniture, filing cabinets, and boxes of materials are moved. When I come in on December 14th to a largely vacant office, I'm expecting to be hit by a wave of sadness. I've spent nearly 16 years in this building. It's tough to let go of that. But what is exciting is designing a space which reflects me.